A new briefing by Egypt Solidarity exposes the scale of the crackdown on Egyptian university campuses over the past academic year. Author Nicola Pratt, Reader of International Politics of the Middle East at the University of Warwick, documents an extensive catalogue of abuses by the security forces including shooting protesting students, arbitrary mass arrests and repeated assaults on university campuses with tear gas and birdshot. Yet student protests have continued for months, as activists challenge the military regime. Download a pdf here and see below for how you can order print copies. Illustrated with full-colour photographs by acclaimed independent photojournalist Mosa’ab Elshamy, the briefing is indispensible reading for anyone who wants to help build a movement in solidarity with Egyptians who are still fighting for the 2011 Revolution’s demands of bread, freedom and social justice. The briefing sets the current repression in the context of the gains made during the 2011 Revolution, when students and university staff managed to win important freedoms and force the security forces to withdraw from the universities. 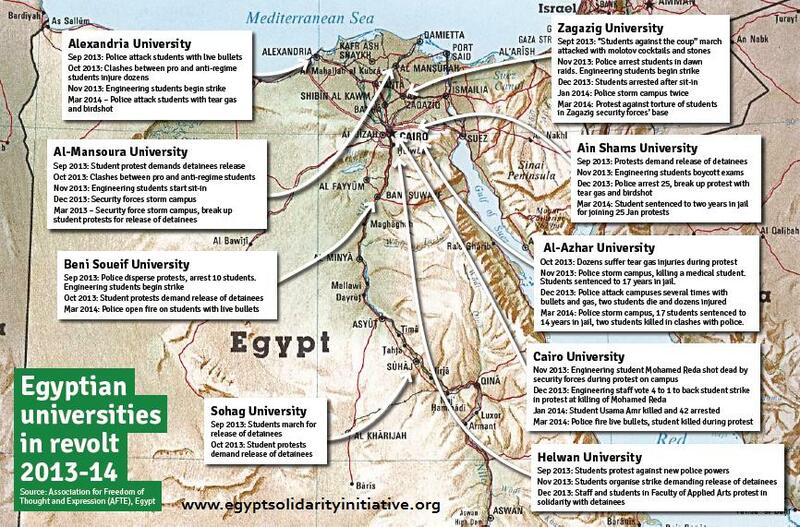 Based on interviews, research visits to Egypt and Arabic data from local human rights organisations, the briefing aims to equip activists outside Egypt with the background information they need to build effective campaigns in solidarity with students and university in Egypt facing repression. With the support of the lecturers’ union UCU, printed copies of the briefing are available free of charge to UCU branches and can be ordered online here. Members of other unions can also make bulk orders at less than £1 per copy using this form and individual copies are on sale for £1 via bookshops and at events and protests. 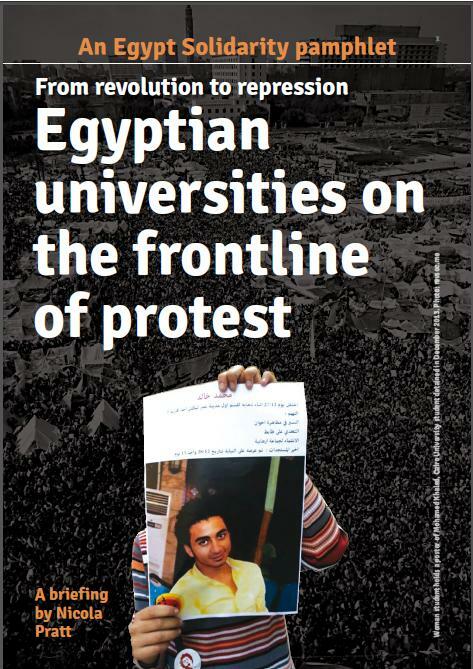 The pamphlet will be launched at a special session of the Egypt Solidarity workshop on 24 May at the School of Oriental and African Studies in London, and will be available for UCU branches to collect at UCU Congress in Manchester 29-30 May.